Easy to install thanks to the pre-attached power cord and the universal Xpress mount which allows it to connect to most 3-bolt mounting assemblies. Motor starts directly at its top speed, so you’ll experience fewer jams. [amazon_link asins=’B01DLKDQYW’ template=’imageleft’ store=’disposalma-20′ marketplace=’US’ link_id=’434b708e-8720-11e7-b5cf-9b61f9570fcc’]The Moen GXP33C is one of the smallest garbage disposal units available on the market today. This model was specially designed to fit into a tight space, so if you’re worried about installing it under your sink, you don’t have to. The unit measures 13.4 x 5.4 x 5.4 inches and weighs just under 8 lbs. One of the great things about this models is that its design allows you to connect it to most 3-bolt mounting assemblies. This is an advantage, especially if you’re changing an old disposal. If it used a similar assembly, you won’t have to change it. With the GXP33C, you get one of the smallest disposals on the market. This unit uses a 1/3 HP motor which produces a grinding speed of 1,900 RPM. The small motor does not produce a lot of noise, but the lack of a sound-deadening feature means that you will be able to hear most of it. Thankfully, the unit’s structure blocks some of the noise, and the disposal is not very loud, to begin with. However, if you’re very sensitive to noises, you might find this disposer annoying. It can actually be louder than larger units that use sound deadening features. This is not a powerful unit, so it will only be efficient if you use it on soft food scraps, like vegetables and fruits. If you want a disposal powerful enough to go through tougher waste, you should choose a larger unit. The Moen GXP33C has a continuous feed operating mode, so it will grind up food waste as long as you power it. The 1,900 RPM the permanent magnet motor produces will be sufficient for soft food waste, but you should be careful not to feed all the waste at once, as this can lead to clogging. While the 1,900 RPM the motor produces is a slightly higher speed than the ones produced by other models with the same motor capacity, you shouldn’t abuse the disposer. Thanks to the motor’s ability to start directly at its top speed, you will be able to grind up stringy foods without harming or jamming the unit, but tough food scraps might harm it. The grind component is built from galvanized steel, so it has corrosion-resistant proprieties, and it’s also very durable. This is one of the smallest garbage disposals available on the market today, so if you’re looking for a model you can install in a tight space, this is the one for you. The GXP33C is easy to install. Most people will be able to install the unit in under one hour only by themselves. The installation guide is easy to understand and follow, and it will provide valuable information for first-time installers. With a grinding speed of 1,900 RPM and a motor capable of producing this speed instantly, this disposal is more efficient than most models of the same capacity. You read more about Moen GXP33C specifications here. Even though this is one of the most efficient 1/3 HP disposals, you won’t be able to use it for anything else than grinding soft food. While this unit is not noisy, it’s not silent either. Some customers state that it’s actually louder than larger disposals. Do not feed the disposal a lot of food waste at once. This can lead to jams. 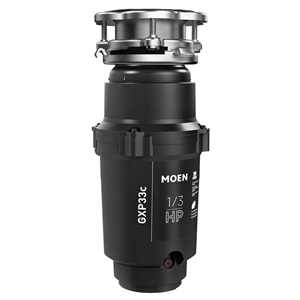 The Moen GXP33C is one of the smallest garbage disposals available, so it will be a great choice for everyone who wants to install a disposer in a tight space. Unfortunately, the small capacity 1/3 HP motor somewhat limits the unit’s grinding abilities, so you will be able to use it for soft food waste, only. Still, if you’re concerned about the amount of waste you produce, this model offers a cost-efficient way to reduce it. We hope you find our Moen GXP33C review useful. If you don’t consider this model is the right fit for you, check out our other reviews to find the right garbage disposal.